Gluten free cupcakes are one of my favorite ways to say “happy birthday,” or even just, “hello.” I also must maintain a steady supply of cupcakes in my gluten free freezer stash for when I find out that my son has a birthday party coming up in school. I love to send him with a gluten free cupcake that has no frosting (too messy!) but is still fun. 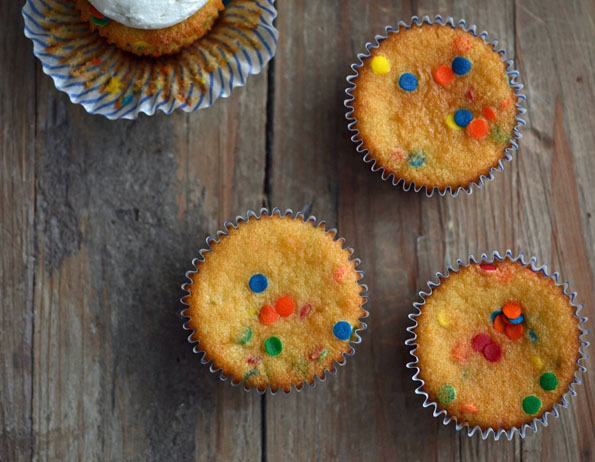 Enter … gluten free funfetti cupcakes copycat recipe. I think they invented Funfetti Cupcakes sometime in the last decade (which just happens to be the decade during which we went gluten-free). Didn’t they? In any event, I sure had never heard of them before, well, we couldn’t have ’em. Then it felt like everyone was all Funfetti Funfetti Funfetti all the darn time. I finally reached the tipping point and found myself staring closely at a gluteny box mix in the grocery store. Wouldn’t you know it? Those aren’t just regular sprinkles or nonpareils or jimmies or whatever you prefer to call them. They’re edible confetti. That’s why it’s called FUNfetti. I have chosen not to reveal whether or not I realized that right away. I’m afraid of what you might think of me. 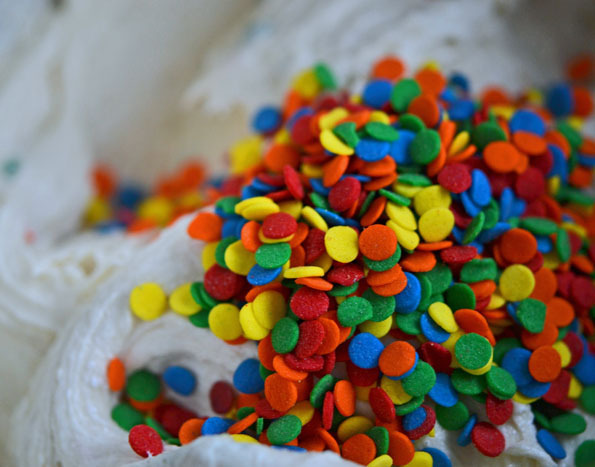 Did you know how many brands of these sort of sprinkles there are out there? Like, a million. Oh, and sometimes they’re called confetti, sometimes sprinkles, sometimes sequins, or even sometimes “quins.” It’s all very confusing. Then I realized that AmeriColor makes a version of them—and I know that all AmeriColor products are reliably gluten-free. So I figured, easy peasy. Just order those. Well, most online sources won’t (can’t?) tell you who makes their individual products (I called at least 10 places, and some were downright surly). Even AmeriColor itself was spectacularly unhelpful. But no worries. Amazon to the rescue! It sells a branded tub of these little cuties. That way, you’re sure you’re getting a GF variety. This is all just a very roundabout way of explaining to you two things. One, we can’t just order edible confetti willy-nilly. Two, Funfetti is totally all I hoped it would be. Preheat your oven to 350°F. Line a standard 12-cup muffin tin with cupcake liners or grease the wells, and set the tin aside. In a large bowl, place the flour, xanthan gum, baking powder, baking soda, salt and sugar, and whisk to combine well. Add the butter, eggs, vanilla and milk, mixing to combine after each addition. The batter will be pourable. 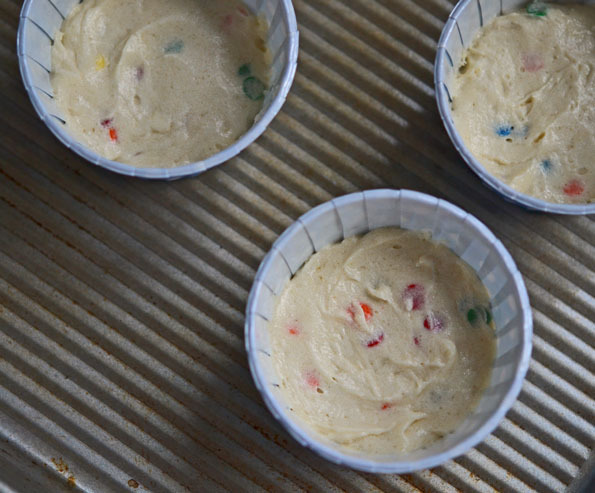 Add 5 of the 6 tablespoons of confetti sprinkles the batter, and mix gently to combine. Fill the prepared wells of the muffin tin about 2/3 of the way full with the batter, and sprinkle a few additional confetti sprinkles on the top the batter in each well. Place in the center of the preheated oven and bake until lightly golden brown and a tester comes out with no more than a few moist crumbs attached (about 19 minutes). 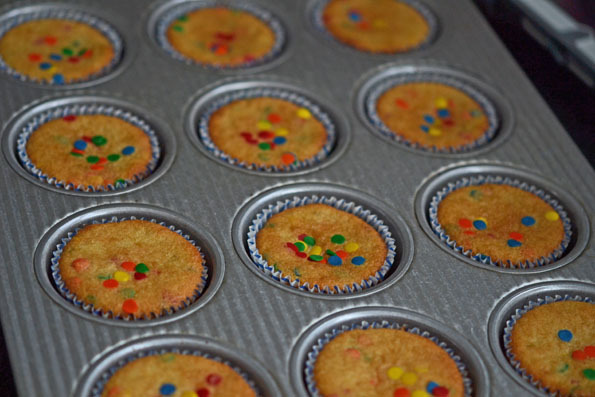 Allow the cupcakes to cool for at least 5 minutes in the tin before transferring to a wire rack to cool completely. Repeat with the remaining cupcake batter and confetti sprinkles. Frost the cupcakes generously with The “Best” Vanilla Frosting. P.S. Don’t forget to get your copy of Gluten-Free on a Shoestring Quick & Easy! I can’t keep the blog going without your support! BEST gf cupcakes ever!! Even my finicky non-gf eater was amazed at how good they were! This is a fast, easy, and delicious recipe. Thank you for posting it and I am SO glad I found your blog! Oh hooray, Mary! May you continue to amaze your family, persnickety eaters and non! My two gf girls are excited to try this today. They never get funfetti cake and at ages 5 and 10, that’s a very sad deal! Thanks for the recipe!! Oh my gosh, Mary, SO sad. Fix that! So, tomorrow (the 8th) my baby turns 3. And her favorite flavor of cake is “plain” as she put is, she means white. I have tried and failed SEVERAL times at a delicious white cake. Me being the slacker that I am, I have put off all birthday stuff until, well, this evening. I just took a batch of these cupcakes out of the oven and they are just like I remember fun-fetti (we’ve been a completely gf house for almost 3 years). Now I don’t have to try to talk her into chocolate cake (although I would prefer it :)). Thanks for making my birthday girl happy! Aw, Lauren, happy birthday to that sweet little girl of yours!! I’m so glad you hopped right on this recipe. Perhaps your subconscious mind knew that I would post this recipe, and so really you planned more than you realized. Or something. One way or another, you got there! I’m happy that the funfetti didn’t let you down and it was all that you hoped it would be! It was my favorite cake ‘flavor’ as a kid. Funfetti and white chocolate cake. Gosh, even the funfetti icing was delicious. 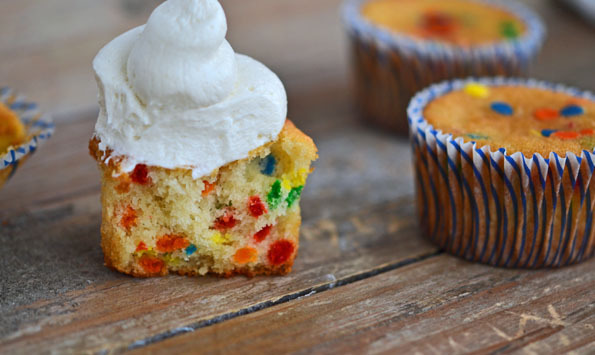 Um, there’s funfetti icing?? Funfetti does not disappoint. Indeed, Leanne! This has me drooling all down my front. Down my front. Sorry about the drool, Laurel. Let me get that for you. This sounds fun and my kids will love it! Any idea if they are soy free?? Thanks! I have both of your books and just love them! So sorry, Writergirl! The ingredients say that they have soybean oil. Bummer!